700 words / 3 min. Please note that this post is from 2012. Evaluate with care and in light of later events. In the case of Charles River Bridge v. Warren Bridge, 36 U.S. 420 (1837), Justice Roger Taney — most known for his opinion in Dred Scott — decided against the owners and investors in the original bridge over the Charles River in Massachusetts. 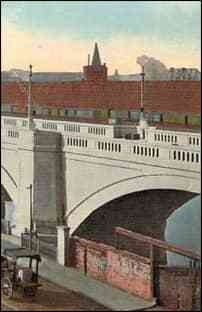 That bridge had been built by a company granted a charter in 1785 for the purpose of building and operating the bridge, and given the right to collect tolls for 70 years after construction of the bridge. In 1828, in the face of rising population numbers in the area — and the continued high tolls and large profit margins of the company — the state legislature granted another company a charter to build a new bridge across the river, one that would become free to use after a short period of time. After the new bridge became free, the old one lost all its traffic — and potential profits — to the new one. Taney aligned the “public good” with progress and technological improvements. 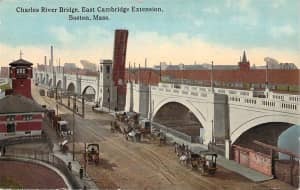 Ruling in favor of the entrenched Charles River Bridge Corporation would mean that the country would “be thrown back to the improvements of the last century, and obliged to stand still.” Id. If an exclusive monopoly were upheld, then incumbent highway corporations would hold back development of new railroads and canals, which were booming as the new technologies of the nineteenth centuries. New developments and new approaches had permitted a new corporation to build a new bridge at a lower cost — and to make it free within a few years of its opening, while still turning a profit for its investors. But in doing so, the profit-making potential of the old bridge was destroyed (although investors had already made back their initial investment multiple times over). But hadn’t the old company taken a risk initially? Didn’t its investors deserve to reap their new profits because they had taken the risk initially? Wouldn’t setting a precedent that their state-granted monopoly could be limited later actually inhibit future investment? If these questions all seem rather familiar in the 21st century, it’s because these are the same kinds of arguments advanced by patent and copyright holders today. Pharmaceutical companies want their patent monopolies to extend further, and argue that failing to grant a sufficient monopoly would inhibit development and investment. Music and movie companies argue that their copyright monopolies should extend even further than it does now — because otherwise creation and investment would suffer. Taney said “no” to this argument in 1837. I’ll ask the obvious question, then: did this decision to limit a monopoly contract reduce investment and technological development in the nineteenth century? The (equally obvious) answer is, “no”: the nineteenth century gave us railroads, the telegraph, the telephone, and much, much more. If there’s anything we can learn from Taney’s 1837 decision, it’s that minimizing monopoly rights does not inhibit development — and, I think, the reverse is even more likely. It’s a lesson we would do well to keep in mind when considering the length and extent of patent and copyright monopolies.